It is no secret that skiers can be gear-geeks. We like to know as much about our equipment as possible, understand the nuances, and find the perfect piece of gear for our budget and the kind of skiing we do. For most of you, choosing a perfect Nordic Skiing Boots can be a daunting task. It’s important to get your hands on the right ones because they are one of the most important components of your ski kit. If you get well-fitting boots, they will keep you going and going all day long. But if you buy boots that are uncomfortable, rub in the wrong spot, or are loose fitting, you won’t be getting the most out of the sport, and your workouts will be cut short. Spend a bit of time getting the boots that offer you the right fit, size, and make. In this article, we are going to provide with you a list of boots most suitable for you cross-country skiing. What makes cross-country different from the other forms of skiing is that it provides such a range of styles. Are you a skate skier or classical? Do you want to compete, or simply get good workouts? Are you racing on groomed tracks or gliding through deep backcountry snow? Our reviews lean toward the classical skiing genre, but most of these brands also make comparable boots for the skate skier among you. 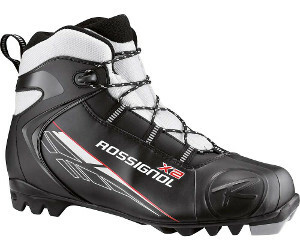 Here are the top 5 cross-country skiing boots. A great gross country ski boot that offers maximum comfort and stability on and off of the tracks, the Alphina Blazer makes it to the top of our list of cross-country ski boots. It doesn’t sacrifice the modern construction with its 75mm touring sole fitting its earlier generation bindings. It comes up with a speed lacing system that makes it possible to settle and fit nicely around the contours of you feet. In addition to this, another comfortable feature that comes with these amazing boots is the padded tongue. On the sides of the boot, an HF heel counter is fully integrated and cups the foot so it will keep your foot from twisting while on the track. This feature also helps you maintain your downhill control and torsional stability. The biggest benefit of all these extra mods is that their lighter weight makes them ideal for a skier whose top priority is minimal weight. There is small downside attached to this, though. Some customers complain that the lacing system isn’t up to the mark. Despite this drawback, the comfortable fit, greater torsional control and stability and lightweight construction puts Alphina Blazer top on our list. The cross-country skiing boot that is good enough to claim the second spot on our list is the Whitewoods 301. This boot is compatible with 75mm bindings. It doesn’t compromise flexibility through the addition of Thinsulate material around the ankle which provides extra support. This material is very special and keeps your feet dry with the help of a quick dry lining also making it breathable. And the boot’s soft ankle cuff does an excellent job keeping out unwanted snow. There are plenty of other options as well to enjoy. There is a removable insole that adds to the comfort, a toe protector, a 75mm touring sole to provide firmer support and a Gaitor D-ring. 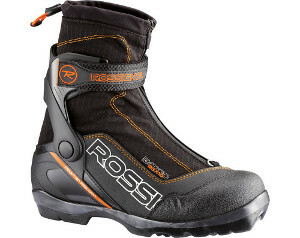 Whether you are a professional skier or a novice, this boot is suitable for all the levels. The reason it takes the second spot on our list is the price is the fact this boot is quite expensive, so not everyone can afford it. However, the Thinsulate, breathable material and the soft ankle cuff are great qualities to look for in any skiing boot. For people looking for something very comfortable and ideally fitting like a glove, the Rossignol X10 is a worthy investment. It offers a unique design that will ensure productive skiing. It comes with a low-profile tongue that features ratcheting quick lace that can be adjusted easily. This assembly provides a comfortable fit without creating pressure points. The Velcro Power Strap is another feature present in the closure system and designed in such a way that it avoids getting in the way of other elements of lacing systems. The external zipper stays out. To prevent irritation in the ankles, the plastic cuff does a good job without compromising responsiveness and support. To facilitate the ankles a bit further, breathable fabric covers the ankles and provides ventilation. However, its minimal foot bed might be uncofortable for some users. 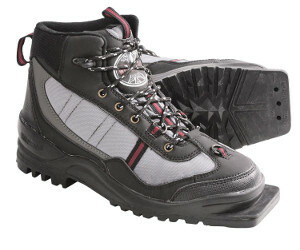 This boot is compatible with any 75mm binding system that is also known as a 3-pin binding system. 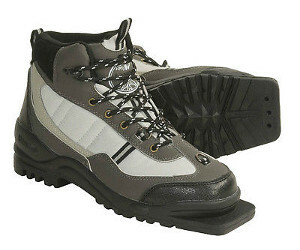 The boots are waterproof, durable, windproof, and incredibly breathable by using King Tex material. The King Tex regulates the body heat and keeps you dry. With the comfort of King Tex, you can enjoy the sport completely while the ankle padding keeps the snow out. This boot package also comes with ski poles that have straps on handles and ski baskets. 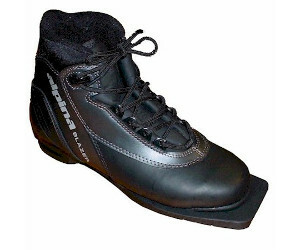 These boots are very lightweight and designed for both beginners and professional skiers. They provide solid ankle stability thanks to the plastic heel support. The boots are surprisingly lightweight and durable and also comes with a safety Speed Lace lock that provides a firm grip. The key to enjoying and getting most out of a ski trip is in choosing the right cross-country ski boots — after all, they are the main point of contact with your ski and the snow. It is also vital that your boots should be compatible with the type of skiing you intend to do, so before splashing the cash on your ski boots, do check out these five cross-country boots!